DODECANESE ISLANDS, THE IDEAL DESTINATION FOR INCENTIVES, CONFERENCES, CONGRESSES, MEETINGS, BUSINESS TRAVEL, INTERNATIONAL CULTURAL AND SPORT EVENTS. The Dodecanese is a complex of over 163 islands and islets, of which 26 are inhabited, situated at the easternmost part of Greece, at the borders of Europe. Almost every island has its Classical remains, its Crusaders? Castle, and its traditional villages in a region where eastern and western cultures have wonderfully blended for many centuries. 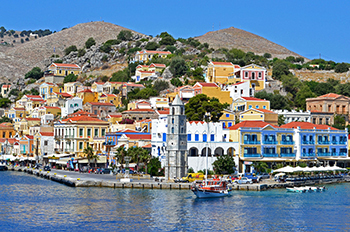 The most popular tourist destinations are Rhodes, Kos and Patmos, while the unspoilt Symi, Halki, Leros and Kalymnos are equally delightful without being crowded. Karpathos, Nisiros, Kastellorizo, Kassos and many other islands of the archipelago are ideal places to experience traditional, serene island life. The Dodecanese islands have been inhabited since the prehistoric period and were first ruled by the Minoans and then the Achaean Greeks. But their economic and intellectual development began with the arrival of the Dorians in 1100 BC, reaching a peak of growth in the 8th century. 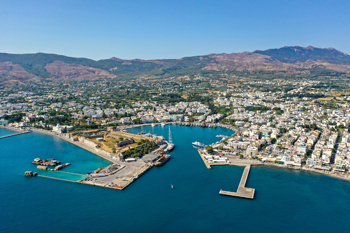 The three great cities of Lindus, Kamiros and Ialyssos, which were founded on the island of Rhodes in the 6th century BC, constituted along with Kos, Knidus and Halicarnassus in Asia Minor, the Dorian Hexapolis (confederacy of six cities). The economical and cultural growth of this area was cut off prematurely by the Persian tempest, which then shook all Greece. After the defeat of the Persians, several Dodecanesean islands became members of the Athenian Alliance in 408 B.C. and the three large towns of Rhodes united into one state. More particularly, Kos prospered in the 4th and the 3rd century B.C. because of the school of "Medicine" created there by the founder of medicine Hippocrates. Because of their strategic and vulnerable position, these islands have been subjected to an even greater catalogue of invasions and occupations than the rest of Greece. The Romans started conquering the islands in 146 BC, inheriting them to the Byzantine Empire who lost them to the Arabs in the 7th century AD. The Crusading armies from Europe reclaimed them for Christendom and in 1309 the Knights of the Order of Saint John who became the rulers of Rhodes, extended their sovereignty to the other islands as well. In early 16th century for the Dodecanese began a long period of occupation by the Turks, which was ended in 1912, by the colonial ambitions of Italy. The Italians, especially under Musolini, tried to reform the cultural characteristics of the region, mainly by discouraging the public use of Greek language and investing in architectural projects that stressed the islands? historical ties with the Latin world. Second World War brought the abrupt end of these plans and the islands were official restituted to Greece in 1948. 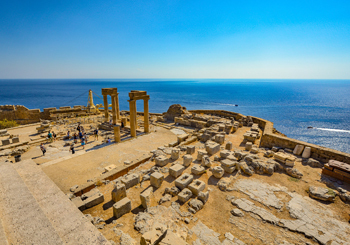 Rhodes, the largest island of the Dodecanese, is famed for its magnificent fully restored medieval town, which is the largest inhabited medieval settlement in Europe. The walled city presents a unique sight, with its narrow cobbled lanes and the Avenue of the Knights which is lined with magnificent medieval buildings, the most impressive of which is the Palace of the Grand Masters, restored, but never used, as a holiday home for Mussolini. Apart from its wealth of history which can be seen in its Archaeological Museum and Folk Art Museum, Rhodes has innumerable other places of interest to visit, among which is a sea level Aquarium in the capital, the natural reserve in Valley of the Butterflies, the impressive castle of Monolithos with its stunning views to the sea, and the ancient ruins of Ialyssos, Kamiros and the once mighty city of Lindos. 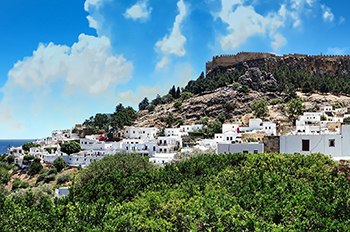 Today Lindos is a picturesque village with whitewashed, elaborately decorated houses and winding streets reaching for the rocky outcrop of the ancient acropolis, where the famous throughout the ancient world, temple of Athena Lindia has been excavated and partly restored. Among the numerous of impressive sights in Kos are the remains from the Roman era, with fabulous mosaics, the palace of the knight of St. John and the "Plane of Hippocrates" (supposedly the tree where the father of medicine taught under), all situated in the capital of the island. A few kilometres away from the city centre are located the remains of Asclepeion, the leading medical sanctuary of the ancient Greek world. Dedicated to Asclepios, god of Healing, son of Apollo, the sanctuary is built on four terraces carved out of gentle hillside adorned with sacred wood and is considered one of the masterpiece of Hellenistic architecture. Patmos is an island marked by the vision of the apocalypse that St. John the Apostle had in one of its many caves. The whole island is dominated by the monastery of St. John, built in 1088 on top of a hill, which was later fortified and served as a refuge for islanders during pirate raids. The Holy Monastery and its treasury, which houses priceless religious relics, hundreds of rare early Christian manuscripts, a large collection of icons, jewellery and embroidery offerings, is open to visitor providing they show the proper respect, meaning no beachwear is allowed. The capital of the island, Hora, located at the base of the high, dark, buttressed walls of the monastery, is a maze of whitewashed mansion-styled buildings, filled with churches. From a distance it looks as a glorified outer precinct to the monastery itself. In addition the island has yet a second major monastery, the Convent of the Apocalypse, set over the proper cave that St. John spent 15 years writing the book of Revelations. Often living on arid lands yielding small quantities of agricultural goods, with only the large Dodecanese islands able to support self?sustained economies, the Dodecaneseans have early relied to the sea as a source of income. Kassians have a long tradition in marine trading, while sponge fishing, was the traditional occupation of men in the islands of Kalymnos, Symi and Kos, as well as to a smaller extent to all other islands. The occupation of sponge fishermen became gradually defunct and their families were well in the process of migrating until tourism growth in the 80s convinced them to move back in. But life on the Dodecanesean Archipelago has still many faces. In highland villages in the interior of Rhodes and Kos, tradition and age-old customs are still alive, almost untouched by the cosmopolitan life of the seaside resorts. Traditional lifestyle is even more evident in smaller islands like Patmos where customs and popular believes related to religion are handed down from generation to generation. Probably tradition upkeep is at its zenith in Olympus area in the island of Karpathos, where time seems to have stopped. There the women in the villages gaze haughtily at the cameras of tourist that convey their traditional, colourful attire to the rest of the world. For sporting enthusiasts, the Dodecanese offers an unlimited array of sporting facilities and opportunities. In particular, Kos being flat is ideal for cycling and the image of cyclists under the palm trees of the island?s capital has become in-fact part one of its tourist attractions and trademarks. Nevertheless a few other places in Greece can match the highly developed sporting infrastructure of Rhodes, where one can practise golf, tennis, volleyball, jogging, aerobics and almost any kind of water sport there is: windsurfing, snorkelling, scuba diving, yachting, water-skiing, paragliding and many more. In the whole of the Dodecanese the beaches are unmatched in alluring holidaymakers from all over the world to experience the joys the Aegean Sea has to offer. In organised resorts in the main islands you will always find experienced instructors, willing to help you get to grips with the more demanding of water sports. The rich culinary legacy of the Dodecanese, sharing similarities with Crete, Asia Minor and Cyprus, will seldom reveal itself to visitors unwilling to look for it at traditional tavernas of highland villages and minor islands. At the major resorts of Rhodes and Kos the cuisine although excellent is rather international instead of Greek. Nevertheless, undertaking a short trip by boat from Rhodes to the small but gracious island of Halki, inquisitive visitors will be greatly rewarded when tasting the local speciality of oven-cooked stuffed lamb ("ofto arni") and the homemade pasta, patiently produced by skilful housewives. At the island Karpathos, you will have the chance to try a great variety of specialities, such as the sesame-honey, the fried delicacies of "xerotigana", various pies and delicious local sweets. At Kos you can taste the local red cheese matured in red wine and accompany it with white semisweet wine. In the confectioner?s shop of the island you may also find the delicious local desserts of Kos, made from tiny tomatoes. 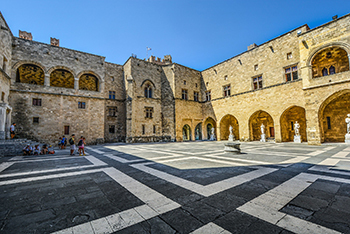 But in terms of shopping, Rhodes is your paradise, with good buys ranging from gold and silver jewellery to leather goods, designer labels and ceramics. Traditional hand made items can be also purchased in the village of Archangelos, south of Rhodes Town, which specialises in pottery and carpeting. The harbour of Kos and the resorts of Rhodes have certainly developed in recent years into the nightspot "Meccas" of Greece. As soon as the night falls the town of Kos is festooned with reflections of lights and music propped up by innumerable bars. The main nightclubs area lies on the northern part of the town, which is home to some famed discos and replete with youthful joints. As for the famous Rhodian nightlife, one is presented with an endless list of choices ranging from small traditional taverns to elegant restaurants serving Greek and international cuisine, along with bars to suit all tastes, discos and a luxurious seaside casino. Undoubtedly the crowning jewel of exciting night entertainment in Rhodes is currently the youth dominated resort of Faliraki, offering everything from wild reveling to bungee jumping.